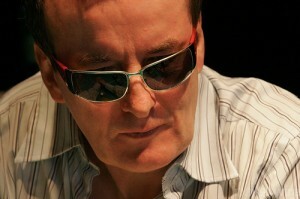 Dave “Devilfish” Ulliott is Britain’s most colourful poker player, known for his shades, black tie and suit, and his personalised diamond knuckledusters: “Devil” on one fist, “Fish” on the other. He leads the professional players delivering seminars at Europe’s largest poker festival, Poker in the Park in Leicester Square, with free entry and hourly tournaments for over-18s today and tomorrow. –How did you get the nickname “Devilfish”? It was a guy called Stephen Au-Yeung. He had this dodgy game: one time I was heading to his house to play, having won all this money earlier, and I thought “what’s the point, I’ve already won”, and went home to sleep instead. That night, three black guys burst in to Stevie’s place with shotguns, obviously looking for me! Even so, I went back another night, and Stevie decided I looked like a Devilfish: it’s what the Chinese call that poisonous puffer fish that kills you if you don’t cook it right. –You’re known as a very aggressive player. Does that work for or against you? It’s about 50-50. People know I’m aggressive – in my last tournament I bluffed all my chips, so my opponent would have to make a huge call — so a lot of people avoid me. The flip side is that a lot of younger guys want to take me on. I don’t stand for any nonsense – I had an argument at the table with Mike Tyson recently in Vegas! I would never insult a young lady, or have a go at a young kid, but taking on Phil Helmuth, or a player like Mike the Mouth, someone’s got to stand up to them. — That’s not the only way to win, is it. Chris “Jesus” Ferguson is the opposite: very mathematical and controlled. I’ve played against him myself, and he didn’t play a hand in an hour. Yes, people ask me what sort of player Chris is, and I say, I don’t know — I’ve only been playing against him for ten years, I haven’t seen him play enough hands to tell! You keep expecting pigeons to land on him. — What’s the most you’ve ever won or lost? I lost $400,000 in a single pot once. My biggest tournament win was $674,500. During the recent World Series, playing in Vegas, I was losing about a million dollars. Then I played a private game at the Bellagio over about five nights, and came back winning. — I hear you play piano almost as well as you play poker. My guitar-playing’s better actually. I can’t read a lick, but I can pick up a tune in a few minutes. I like to jump up with a band when I get the chance, I did that just recently actually. It were a good night: I was with my niece, and she found her boyfriend because he put on his MyFace or whatever it is that I was his favourite player, so she got in touch. — You’ve got seven children of your own. Enough for a poker game! Along with my 21-year-old girlfriend, it definitely is. The youngest is 11, and yeah, we have games together. I used to play with my Mum and Dad, though Dad was not a very good loser. I’d bunk off school to play on a flat tombstone in the cemetery, they’d never look for you there. I started playing seriously at the ripe old age of 15, when an older guy saw some talent in me and signed me into the local casino. I then lost for the next two years, so I don’t know what talent he saw. Then I was driving up and down to the motorway to get to games other people wouldn’t play. We’d play Dealer’s Choice, where you had to be able to play any one of 15 types of poker. It’s a different story from the internet today, where it’s all so easy. –And where would you recommend playing? My own site, of course: www.Devilfishpoker.com. We’re running the Poker Olympics at the moment while the real thing is going on, with extra prizes to the winners. I play there, too, and there’s an extra “bounty” for you if you knock me out. The one I play in the most is the Victoria Casino. But the Gutshot club and Loose Cannon are both very good. — I hear you were name-checked in EastEnders. Amazing how big poker is these days, innit?